Advancis Lipo 3 fat burner is a food supplement which contains ingredients that improve appetite control, regulates sugar metabolism and help to the reduction of body weight. 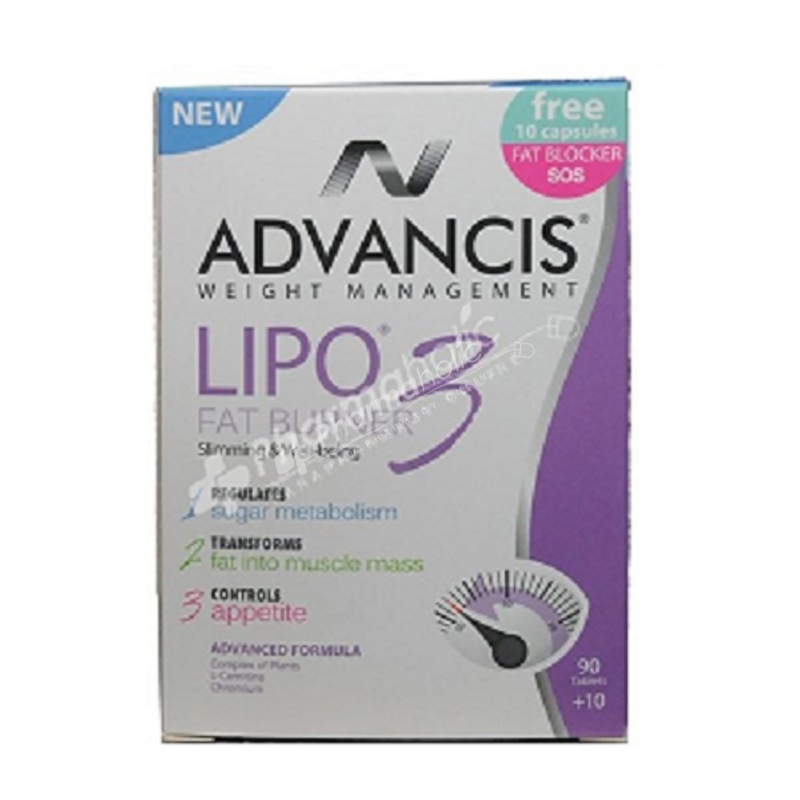 Advancis Lipo 3 is a food supplement which contains ingredients that improve appetite control. Regulates sugar metabolism and promotes the transformation of fat into muscle mass, eliminating superfluous fatness and helping to the reduction of body weight. Advanced formula : complex of plants, L-Carnitine & Chromium. Take 1 pill 30 minutes before the main meals (breakfast, lunch, dinner), with 2 glasses of water. It was especially developed to be taken before high caloric meals, high in fat and sugar thereby promoting body maintenance or weight loss. Advanced formula: Chitosan, Vitamin C, FOS & Cinnamon. GARCINIA CAMBOGIA (400mg), SOYA LECITHIN, GLYCINA MAX (300mg), PHOSPHATIDYLINOSITOL (42mg), PHOSPHATIDYLCHOLINE (69mg), L-CARNITINE (250mg), CELLULOSE MICROCRYSTALINE (200mg), PIRUS MALUS, APPLE TREE (150mg), CHROMIUM TRICHLORIDE (372μg), CHROMIUM (120μg). DIABETIC PATIENTS SHOULD MONITOR OFTEN THEIR BLOOD SUGAR LEVEL.CONTAINS LACTOSE AND A SOYA DERIVATIVE. CAPSULES ARE NOT RECOMMENDED FOR PEOPLE WHO ARE ALLERGIC TO SHELLFISH. NOT TO BE USED AS SUBSTITUTES OF A VARIED DIET. SHOULD NOT BE TAKEN DURING PREGNANCY, BREAST-FEEDING AND BY CHILDREN UNDER 12 YEARS OLD.